In celebration of the wonderful warmer weather that has been gracing the midwest the past week, I decided to pull together some laydowns for spring. I've been digging through my closet pulling together some old things and new things for some looks that are casual and fun for the season. I love finding that piece in my closet that I had forgotten about and mixing it with something new. So without further ado, here's some spring looks for you! 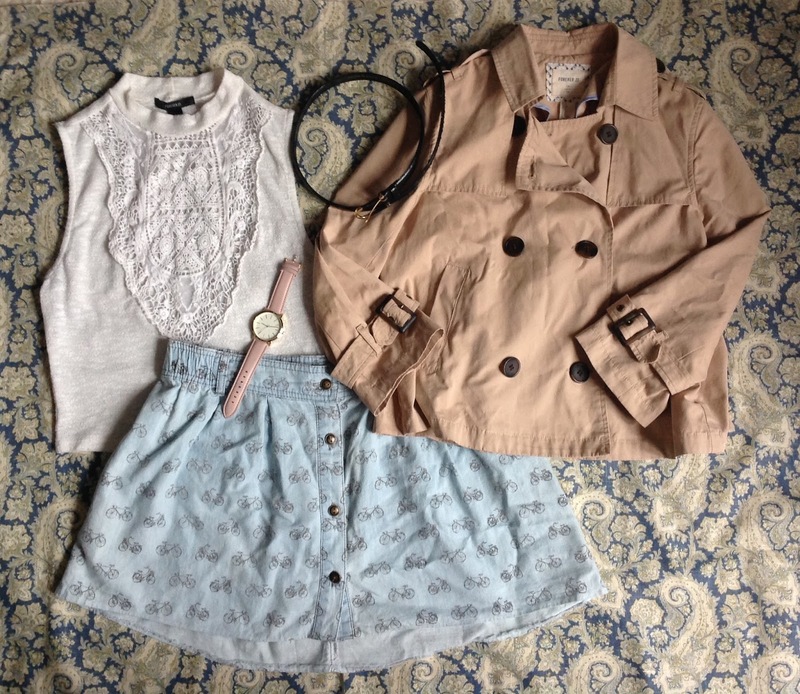 A good cropped jacket can go pretty far. I'm a little on the shorter side, so full length trench coats don't do a lot for me. This cropped friend is great and is a much better silhouette for my body type. Plus it's lightweight enough for the season. Here it is on. My other favorite piece in this look is the bike skirt. I did some alterations to this when I bought it, turning it into a mini because I loved the print so much. 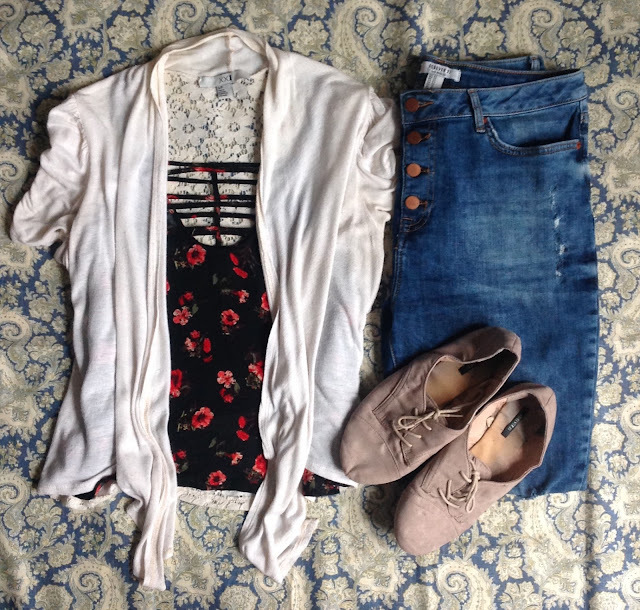 High waisted distressed denim and a cute floral camp make this outfit feel effortless and carefree, but there's also some great style elements at play here. I got this top on sale for $4, and it has been an invaluable addition to my wardrobe. The interesting neckline gives it an unexpected quality and it looks great layered under thinner layering shirts (shawls, shirts meant to be layered with camis, etc. ), and the floral print is fun and uplifting. It's a feature piece that I got for a steal, and it doesn't get much better than that. Denim is often seen as casual, but the fact that it is distressed and highwaisted with cute button detailing makes it special and adds interest that pushes this look to be both casual and unique. This look really bridges a gap between fancy and laid back. Typically I think overalls get the reputation of being a "dress down" option. The first thing I picture when someone says overalls is someone painting a room, with ripped overalls, their hair is in some messy half ponytail, paint roller in hand, and theres that one necessary white paint fingerprint on their nose. Let's make no mistake: I would be nowhere near a paint bucket while donning this outfit. Both the floral print and the crochet pairing bring this look out of the paint project realm and into the 'casual picnic by the lake' territory. Now I'm picturing sunny days and bagels. 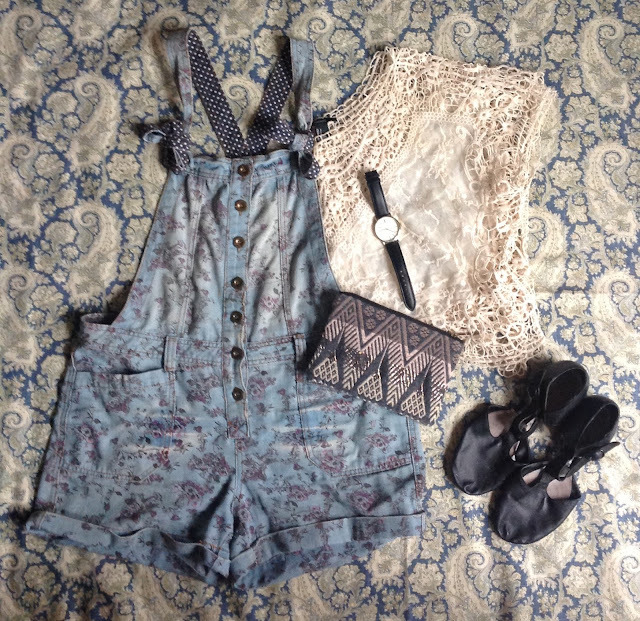 Every once and a while I go for a little bit of bohemian style, and this outfit is spot on. 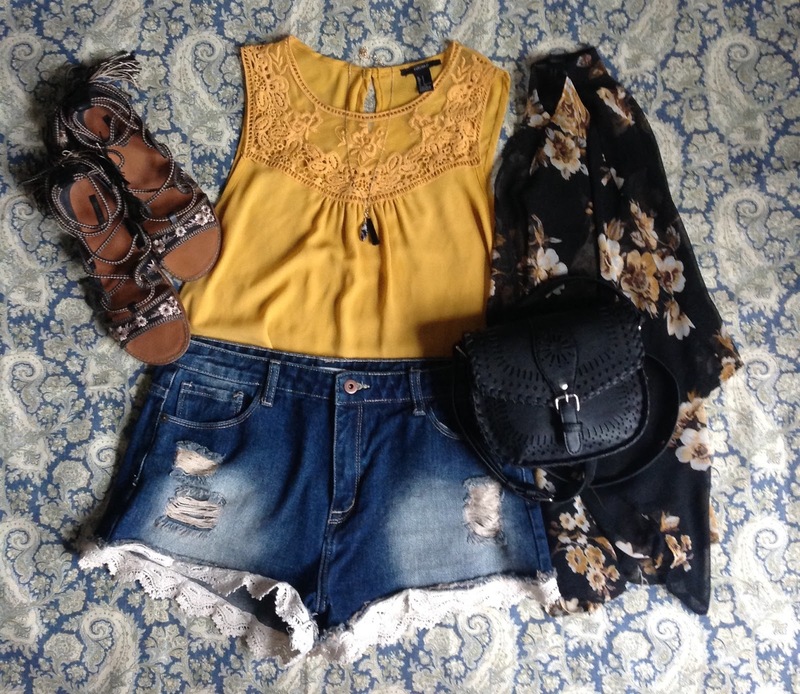 The bright yellow blouse is great for a sunny afternoon, and it's effortless with a floral kimono and distressed shorts and gladiators. If you need me, I'll be at Summerfest; you'll find me in this outfit. At first I was a little hesitant about the whole suede thing, and even more so about lace-up silhouettes. But between button up skirts and adorable front pocket detailing like on these shorts, I'm now fully on board. I'm loving the fabrication mixing in this look, from lace to quilted leather to suede to canvas tennis shoes, I'm excited to rock some texture mixing in the spring (what?!). Yeah. Hopefully these looks can serve as some great inspiration on spring styling and future fashion loves. It's definitely got my creative juices flowing and I'm feeling inspired for spring!